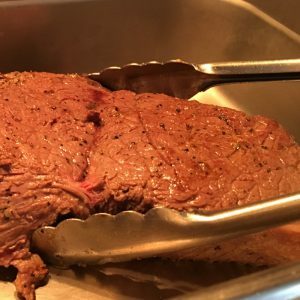 Oven roast tri-tip is great now that you are tired of eating turkey and definitely need something else to cook. I served this four ingredient recipe with chimichurri. This is the first time I’ve even oven roasted a steak. 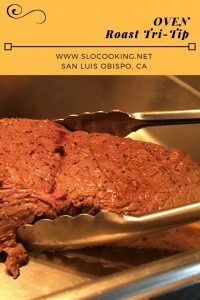 As we live in the heart of the land of Santa Maria Style BBQ, normally tri-tip is slow cooked over aged red oak. Happily my husband enjoyed this style of cooked steak and I will be doing it again. While we DO have great weather most of the year, this is a great alternative if you live somewhere where it is too cold or wet to BBQ.